So I admit that I have been in and out of this blog thing for awhile now. But I have a good excuse. I turned all the food I was eating into a human! Her name is Violet and she is made of mostly donuts. Life is just a little different now. We are mostly making healthy recipes these days and since it is summer, all we do is grill. There’s not a lot of recipe creation that goes into grilling. But I have been working on creating healthy snacks for breastfeeding moms. 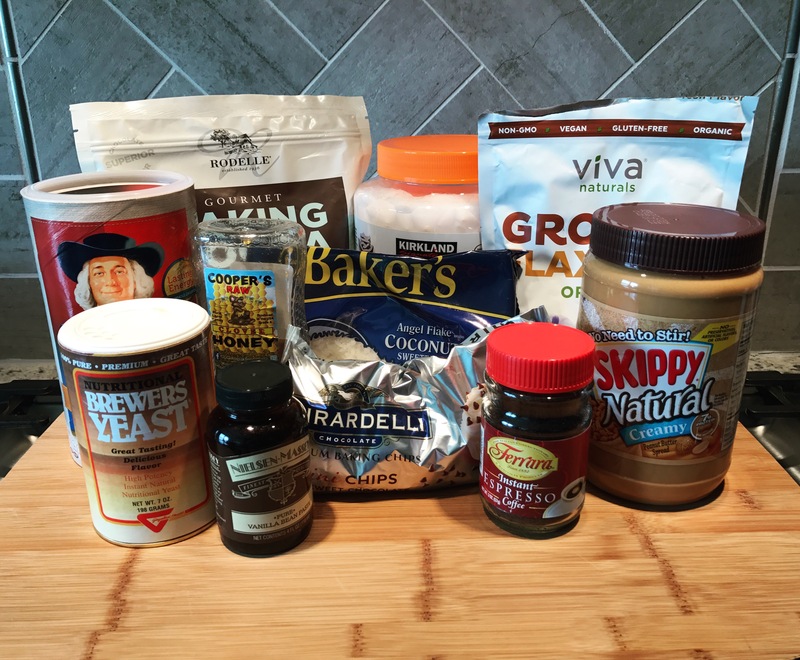 I have tweaked my chocolate chip cookie recipe to up the fat and protein content. I am convinced that if I allow myself to eat as many of the “lactation” cookies as I want, my milk supply does get a boost. The cookies are delish and my husband loves them too. And no, he hasn’t started lactating from eating them. (Chocolate chip lactation cookies recipe coming soon.) This energy bite recipe has NO baking required. Let me repeat that… NO baking. You just mix them up, chill it, and roll them into balls. This recipe is great for everyone to snack on but is especially made for breastfeeding moms. It has lots of healthy milk boosting ingredients, its high in protein, and it gives you an energy boost. I have been keeping a supply of these in my fridge at work and I eat one pretty much every time I pump or if I feel like I need an energy boost. 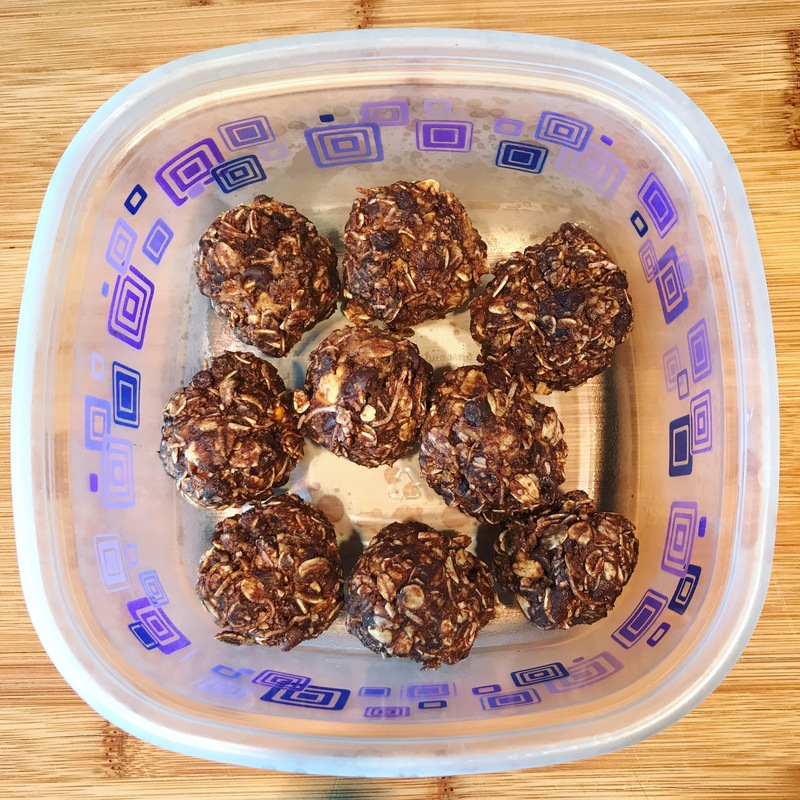 These energy bites are also a great chocolate fix if you’re having a craving. All of these ingredients were available at my local Hy-Vee. I did get this fancy coconut oil from Costco though, and it’s fantastic. If you are having trouble finding any of the ingredients, they are definitely all available on amazon. Sometimes I add chia seeds to these and I have swapped the PB for crunchy peanut butter or almond butter. You can kind of tailor these to what you like. Ground flax seed is my new health obsession. It is super high in fiber and omega 3s. It is jam packed with antioxidants and is very low carb. Not to mention, it has numerous other nutrients and vitamins. I do like to add plenty of extra ground flax seed to cookies and such, it does not affect the taste of baked goods. These energy bites are a little more sensitive and you don’t want to go too over board. The other thing about the extra ground flax seed… it does have a laxative effect if you eat enough. For most new moms, this is going to be a plus. But if that’s not what you’re into, go easy on the flax seed. There have also been a few studies that suggest consuming flax seed contributes to weight loss. The benefits just don’t quit!! Coconut oil provides an excellent source of saturated fats which help promote good cholesterol and break down the bad LDL cholesterol. There have been some controversial studies that show coconut oil contributes to weight loss. There are a number of reasons that these studies are biased and likely inaccurate. But it tastes delicious in these energy bites and has to be a healthier alternative to butter. If you’re anti caffeine, you can easily skip the espresso powder. I personally like to double the amount :). Brewers yeast is a specific ingredient that is supposed to boost milk production. It’s really the only thing I would leave out if you aren’t making these with the intent of boosting milk supply. 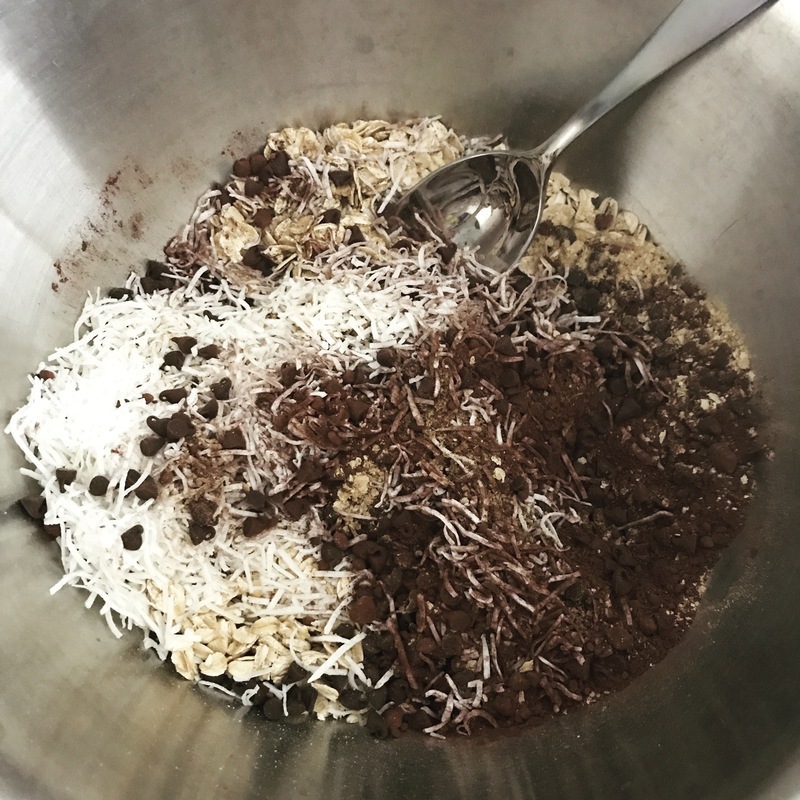 In a large bowl, mix together all of the dry ingredients (oats to brewers yeast). Make sure they are mixed up well. Add in the vanilla, peanut butter, honey, and coconut oil. Mix well with a spatula. Chill in the fridge for 30 minutes. Roll into tablespoon sized balls. Store in the refrigerator in a Tupperware or ziplock, so that they will keep their shape.